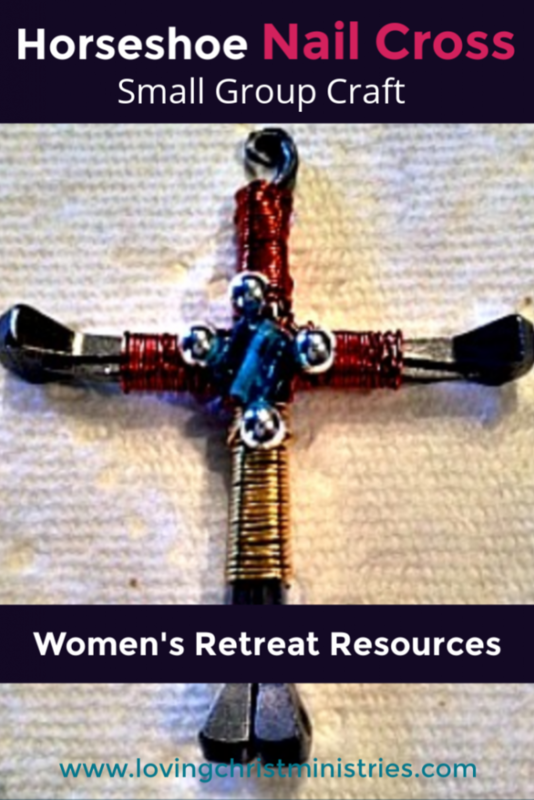 A horseshoe nail cross makes a beautiful takeaway for the ladies at your retreat. 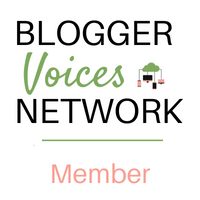 We offered this craft as an hour long breakout session and had to cut off sign ups as so many people wanted to participate. 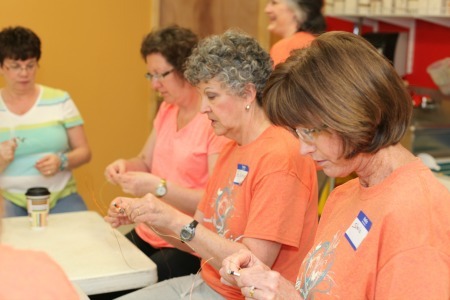 Next time, we’ll have to buy more supplies and either hold two sessions or make the session longer in order to allow more of the ladies to attend. The leader of this session, Jody, bent all the nails ahead of time so that the ladies wouldn’t have to. 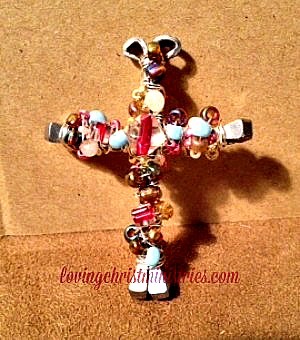 This was probably the most difficult part of the cross, and it helped save time and frustration for the ladies to have it done. Place the head of two nails, one at a time, against the block of wood. Use the vice grip to bend each nail to a right angle, using the block of wood as your guide. Bend each of the four nails according to their appearance in the first picture above. *Note – you could also shape the bent nails into the cross ahead of time depending on the length of this session. To form the nails into a cross – on a flat surface, align the nails to form a basic outline of a cross. Add loops at the top (see one of the pictures to view how the loops should look). Each bent nail forms one quarter of the cross. With the vice grips, secure a top and bottom nail together in order to form half of the cross. Work with the vice grip until you are sure both nails are aligned and create a smooth edge. The wire you measure out per cross should be approximately four times the length of the cross. You can add beads to the wire now if you want to decorate with them. Hold one end of the wire taut and begin wrapping it around the part of the cross being held by the vice grips. You can position the beads however you’d like. When you reach the vice grips, you can then release the half cross. If you’ve wrapped the wire tightly enough, the half cross should stay together. Repeat this step for the other half of the cross. Be sure to leave excess wire on the top loops. Position the two wrapped halves together and secure the bottom with a rubber band. Make sure it’s tight and that they are positioned evenly. Measure out more wire, again about four times the length of the cross. 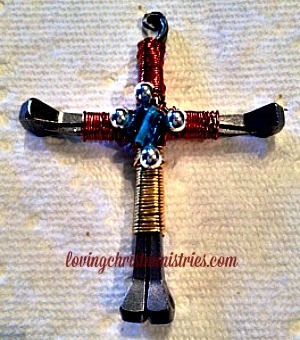 Push the end of the wire through the middle of the cross and pull it through to half of its length. You can add more beads here if you want. Wrap the wire beginning at the intersection of the cross and create an ‘X’ at the joint. Grip an arm of the cross for purchase, then wrap the top with the wire first, and then the bottom. Be sure to position the beads (if you added them) where you want them. Once you reach the rubber band, you can remove it and finish wrapping. Remove the grip from the last arm of the cross and wrap the wire the rest of the way by hand. Use wire cutters to cut off the excess. Be sure to smooth any sharp edges with the pliers. 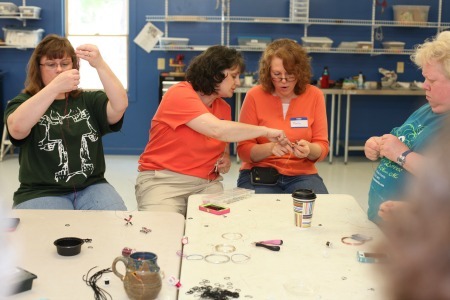 Some of the ladies used a leather cord to create necklaces out of their crosses. Others chose to take them home to display them. One lady, weeks later, pulled her cross out of her pocket when we ran into each other at the store and told me she likes to carry hers with her. When she needs comfort, she holds onto it. I thought that was just beautiful! 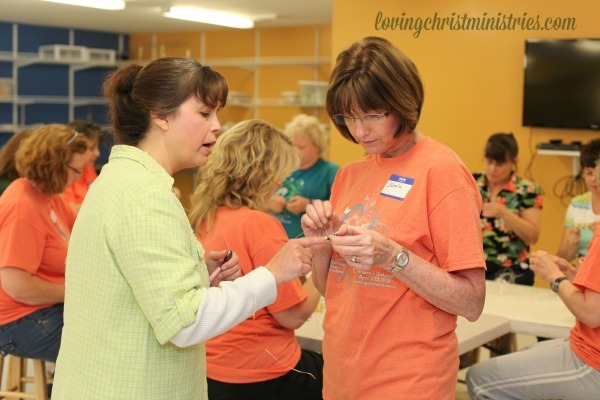 If you have questions about making your own horseshoe nail crosses, be sure to email. These are awesome! What a great reminder of what He did for us! The are so much fun, and you’re right. They are great reminders! What a fun craft. I had never thought of making a cross out of horse shoes. They turn out so cute, too. If you try it, I’d love to see the results! 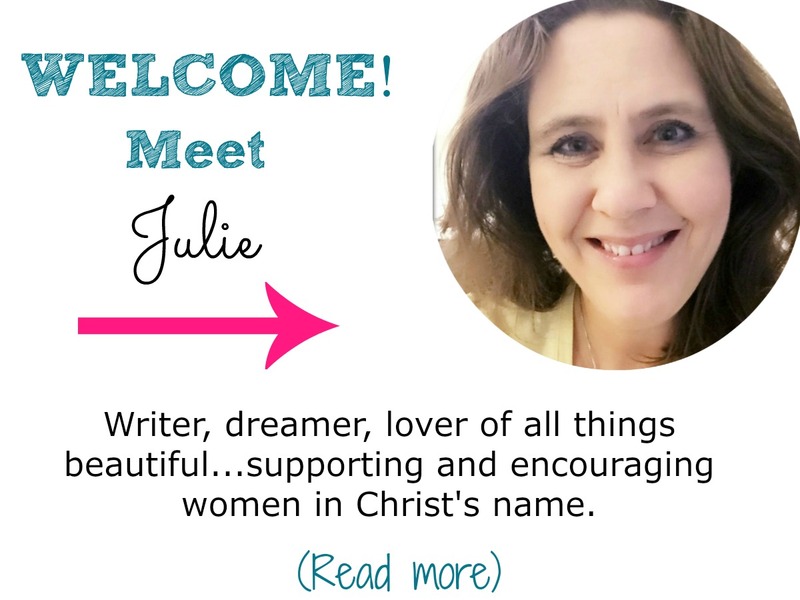 Hi Julie. This craft looks hearty enough to entice my tween-age daughter to do with her friends at a sleepover. They won’t think it’s childish since they’ll be wielding tools. I love the idea. I think they’ll love it! Let me know how it turns out!